I've already mentioned this to some of you, but plans are set in stone now for a new type of PD / Academy at the Curriculum Mapping Institute this summer. 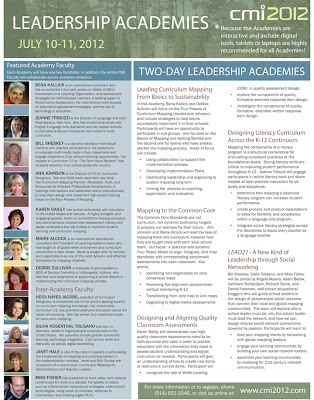 I am excited about the opportunity to be a live presenter at the 2012 Curriculum Mapping Institute LEAD 21 Academy on July 10 and 11, 2012 in Saratoga Springs, New York. I'll be joined by several colleagues that I'm really looking forward to working with, including Bill Sheskey, Silvia Tolisano, Angela Maiers, Richard Byrne, Adam Bellow, Daniel Newman, and Cathleen Richardson. 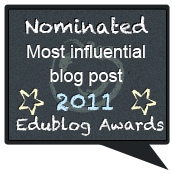 This 2 day academy brings together some of the top education bloggers and network leaders in the United States. These hands on work sessions will guide you in creating a vision of who a school network leader must be, why the school leader must lead the network, and how you can design diverse social network connections infused with knowledge and powered by passion. As a school leader or teacher you will have the opportunity to design your own personalized social network that will connect your local and global learning communities. This Academy is just the seed for all that will bloom AFTER the Academy is over. This Academy is creating a true 21st Century "Lifelong Learning" moment for all participants, leading by engagement, by participation, by passion, and by leveraging popular social technologies! For early bird discount registration information (by Feb. 1st!) please visit www.cmi2012.com or click HERE to register directly. Also of note: This is our third year in Saratoga Springs. If you've never been there, it's definitely a hidden treasure. In the past we've enjoyed the warm evenings with collegial conversations at world class restaurants, Southern Style Porch Socials, Sidewalk Astronomy, Film Screenings, and more. 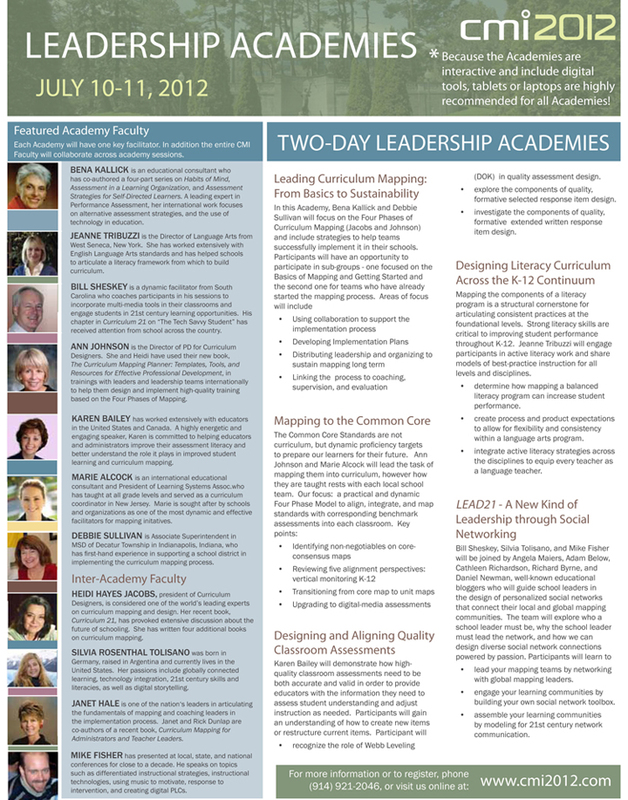 I look forward to seeing you in July and can't wait to bring this new form of Professional Development to the Academy! Access the full four page brochure here. 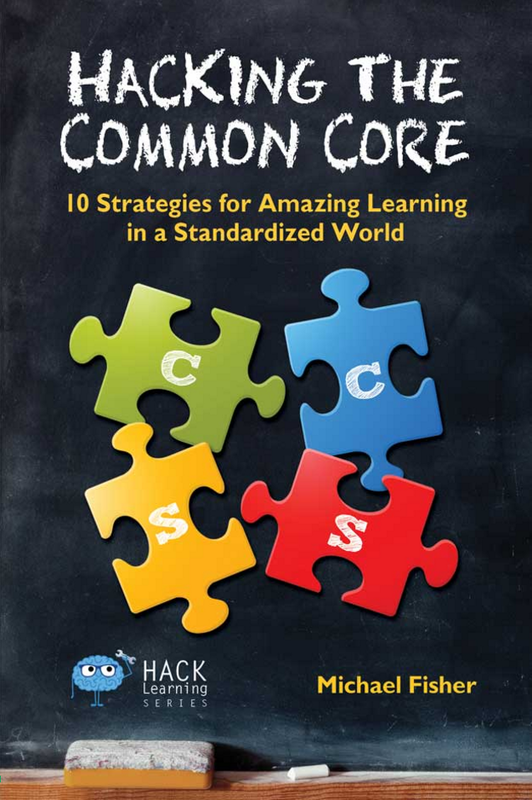 Several things related to assessment around the Common Core/PARCC/S-BAC have come across my plate recently and I thought I would share. 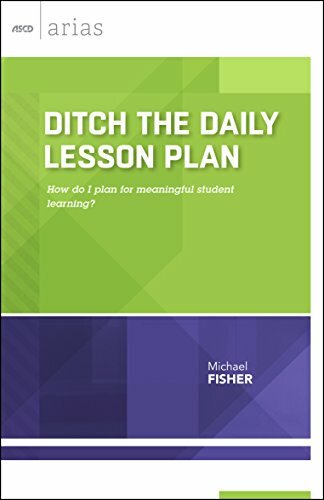 The unifying factor here is that there are multiple stakeholders developing performance tasks, unit plans, assessments for different purposes and the main take away is that it is all relative until we get more specific information from PARCC or S-BAC, depending on which your state is participating in. I would encourage anyone looking at the assessment component of the Race to the Top initiative to check out the PARCC Model Frameworks Document or S-BAC’s Overview Presentation. You can also follow PARCC on Twitter for more informal updates. 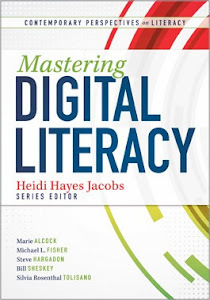 That said, there is evidence that the Webb’s Depth of Knowledge (DOK) levels are in the mix, though much of the assessment work is still hovering in DOK level 2, in my opinion. 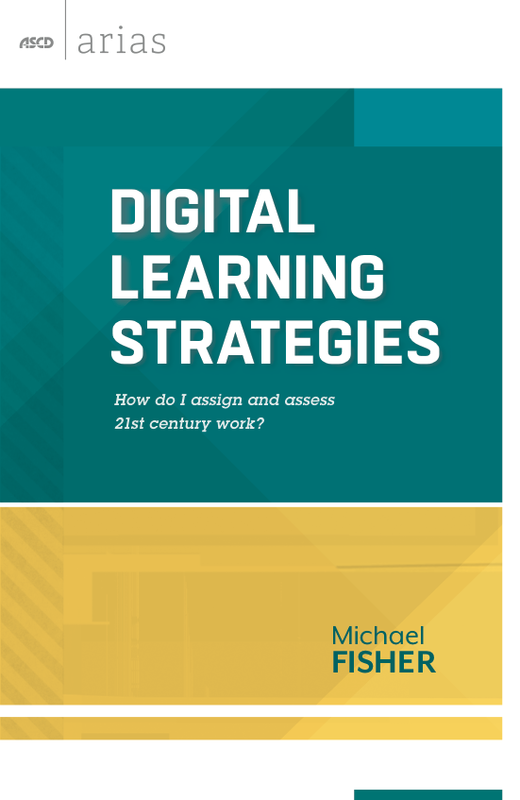 (And still emphasizing what I would consider level 1) Anything, in general, that I see that asks students to explain their reasoning or even construct a response based on evidence is moving more toward the strategic thinking or DOK level 3 zone that I thought was going to be more apparent in the new assessments. If you need some guidance on Webb’s Depth of Knowledge levels and/or its relationship to Bloom’s, there’s some info on Ann Johnson’s Mapping to the Core page. The following are just links I’ve found over the course of the last few months that I think are interesting, if for nothing else than just being FYI. Many districts are already doing some work on Formative Assessments or Common Assessment moments to guide instruction throughout the year. Perhaps some of these links will provide fodder for your own development or assessment conversations! The project is working to design and develop well-engineered assessment tools to support US schools in implementing the Common Core State Standards for Mathematics (CCSS). Happy New Year, and welcome to the Year of the Common Assessments. Or at least the year of common-assessment procurements. 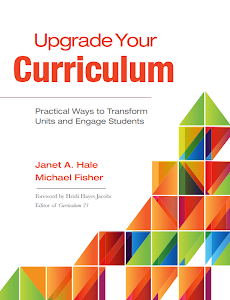 To support schools in meaningfully implementing the Instructional Expectations for the 2011-2012 school year, NYC educators and national experts worked throughout the 2010-2011 school year to develop Common Core-Aligned Tasks embedded in a unit of study. This overview of the Smarter Balanced Assessment Consortium’s plan includes some sample questions and performance tasks. 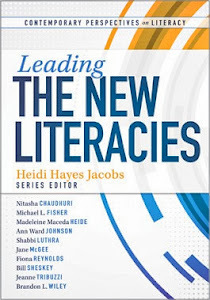 PDF booklet that explores the new assessments. An updated resource on the comprehensive assessment designs and related activities being launched by the Partnership for Assessment of Readiness for College and Careers (PARCC) and the SMARTER Balanced Assessment Consortium (SBAC). This is a webinar from the American Council on Education around assessments for College and Career Readiness. 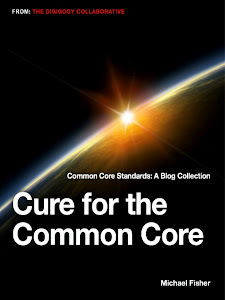 This is a resource document from Pearson Education.